Believe it or not, this is the last weekend to finish up your Christmas shopping and there are only four more days to squeeze in that last bit of last minute Christmas gift buying. It seems to me that one of the most difficult people to shop for are men; luckily as long as the gift involves alcohol, something outdoorsy, sharp looking, techie, very manly, or just something they simply really, really wanted they seem to enjoy the gift. So for the last gift guide of the season I have put together a few gift ideas that basically man would love. Happy Shopping and Merry Christmas Season! 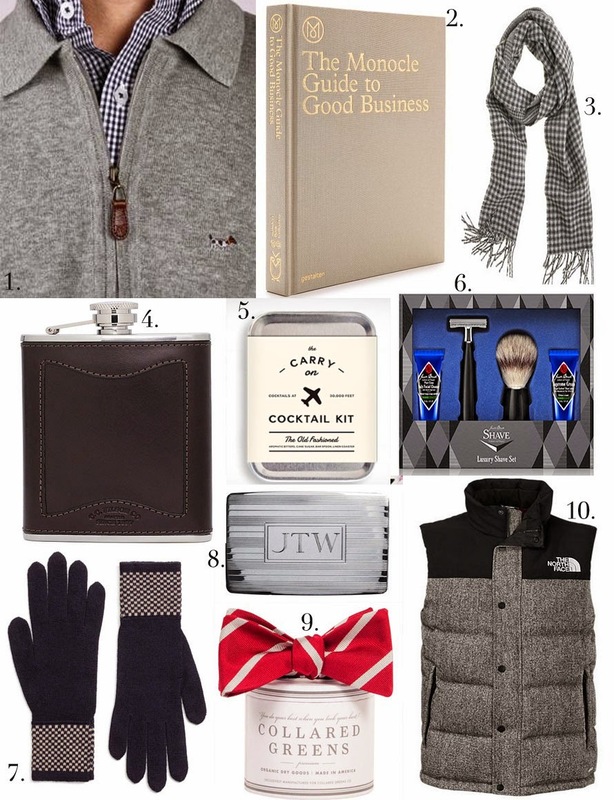 Here’s where to shop for my above top 10 gifts for him. Click on the name of the item to be directed to the website. These are great idea's for last minute shopping. That carry on cocktail kit is perfect! I think the carry on cocktail kit is a pretty neat thing and I love how it looks! The guide and the northface jackets are so cool!! The gloves and vest are very nice idea to give for a present! I really love that tweed vest and the gloves would looks so great with it! Happy to see you enjoyed this gift guide! I agree! I think men are so difficult to buy for. I'm still at a loss for what to get my dad because he is so picky. These are some really great ideas! I definitely bought my brother a luxury shave kit the other day. I love that flask though! Most men would love to have one like that, I think. I think the luxury shave kit would be a pretty neat thing for a guy to have and I agree, I think almost any man would love that flask! Shopping for me can be a bit of a task but happy to hear you enjoyed this gift guide!